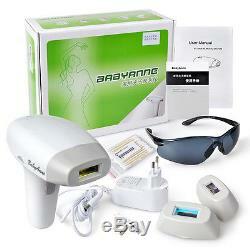 Babyanne 3 in 1 Laser IPL Permanent Hair Removal Machine with Whiten skin &. Do not use the applicarion under the following condition. If your natural hair colour in the treatment areas is light blonde, white, grey or red. If you are pregent or nursing. If your skin was exposed to strong sunlight or artical tanning during the past 2 weeks. If you have a naturally brownish black or darker skin. If there is a wide range of dark spots such as : freckles, birthmarks, moles etc. Tattoos, eczema and other wounds on exposed skin, or had suffered from skin cancer in the past. Please shave the hair firstly in the treatment areas, otherwise, the hair may get burn and skin feels painful. IPL Technology , Achieving Permanent Hair Removal. The wonder of HPL technology is its ability to pack the efficiency and professional results of in-office laser treatments in a safe, portable and easy-to-use light-based device in the comfort of your home. Stay continuously hair-free with no re-growth with HPL technology. 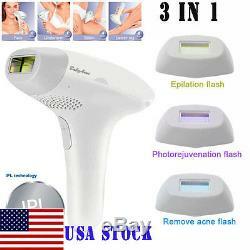 Included 3 falsh heads - 3 in 1 function for Hair removal & whiten skin & Acne- repair. With 5 setting level - suitable different people. 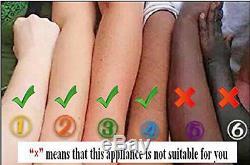 You can be chosed the level according to your skin & hair color. Light-based hair removal , No more waxing, shaving or plucking. Perfect for sensitive areas withiout Painlessness , it can remove b armpit hairarms legs forehead hairline & bikini hair. Safer : with one pair of glasses for eyes protective. Fast - wider 4cm2; new slides and flash mode, faster application and the steps & the flash mode for precision processing of the application window. Easier & High cost performance. 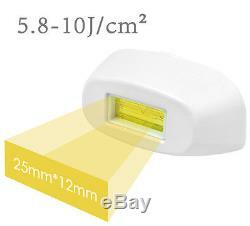 100-240V AC can be used worldwide. With EU and US standard plugs will be provided in the package. Which light intensities are most suitable for you? Please firstly consult the table below to determine which light intensities are most suitable for you (if it is not , this is indicated with x in the table). Operating temperature: 15 to 35. Storage temperature: 0 to +60. Spectrum of hair removal falsh head > 470nm. Spectrum of skin smoothing falsh head >470nm. Spectrum of anti-acne falsh head >430nm. 3 In 1 Fuction Details. >470nm filters Yellow Light: remove unwanted hair. It works by heating up the skin hair and hair root and then destroys the structure of the hair follicle. >570nm filters Red Light:Skin collagen absorbs certain light wave length and improves collagen synthesis and rearrangemen to whiten your skin. >430nm filters blue light: Acne treatment. Highly pure blue light can kill skin bacteria and perfect for wound healing. Intervals of 1-2 weeks in the first two months: There is no obvious effect , after about 3-4 times, you will see the hair starting to shed. 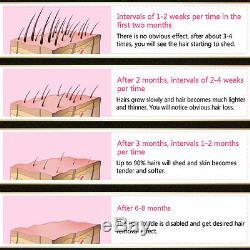 Intervals of 2-4 weeks after 2 months: hair becomes thinner and lighter, you will see obvious hair loss. Intervals of 1-2 months after 3 months: up to 90% hair loss and your skin becomes tender and softer. After 6-8 months: The hair follicle disabled, you will experience desired effect. How to achieve optimal results. It is normal that hairs are still visible after the first few treatments. To remove all hairs successfully and prevent the hair follicle from becoming active again, the treatments have to be repeated once every two weeks for the first two months. 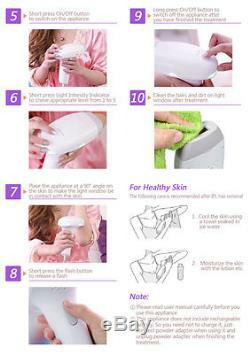 Your skin should be smooth by then.. 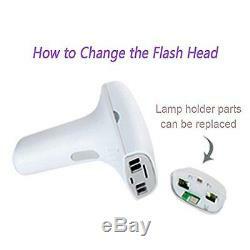 Working principle of this device is heating the hair roots and skin. Melanin in the hair and hair roots absorb light pulse release. The darker the hair, the more light can be absorbed. This process stimulate hair into the telogen. In between treatments, natural hair sheds and regeneration is prohibited. Hair can take twelve weeks to get rid of. Optimization of hair removal can not be obtained with a single session, since only hairs in the growth phase and easy to light therapy. During processing, the hair is generally treated area of hair growth cycle in the different stages. In order to effectively treat all hair, you have to repeat the treatment every two weeks, two months ago. 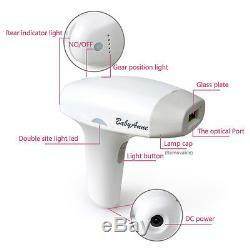 1 x Hair removal unit with hair removal head. 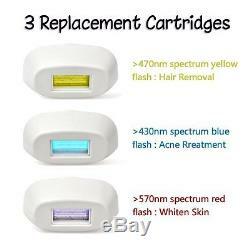 2 x Spare cartridge(Head for tender-skin & Head for Acne- repair). 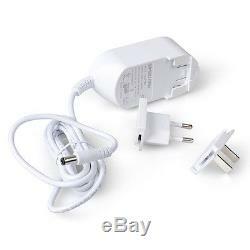 1 x Adapter/ charger with USA & EUR Plug. 1 x One pair of glasses for eyes protective. 1 x One English user manual. 1 x pack of cotton swab (12 Pieces). The item "USA 3 in 1 Laser IPL Permanent Hair Removal Machine Face Body + Whiten skin FDA" is in sale since Thursday, July 21, 2016. This item is in the category "Health & Beauty\Shaving & Hair Removal\Laser Hair Removal & IPL".1" and is located in Carson, California.